Burning Man is not the typical place people would go to view art in the “default world” (the term “Burners” have for the “muggle world” those of you who are not here in Black Rock City inhabit). It’s extremely hard to get here – far less accessible than most public municipal art – and upon arrival, it is more physically inhospitable than the most uptight New York art gallery. It’s so filthy here that the least dusty place you visit each day is a port-a-potty, and the cleanest part of your body is the inside of your shoe – not exactly the way you feel when visiting the Museum of Modern Art. But Burning Man is a launching site of the most interesting and fun large-scale public art, architecture and public planning projects on the face of the planet. Many pieces get major exposure here before being placed elsewhere. Long before the Big Rig Jig hovered in Banksy’s Dimsaland, the Raygun Gothic Rocket Shiplanded in San Francisco, or Cube-a-tron arrived in Zurich’s train station, I saw it years ago here on the playa. Here’s a guide to a few of this year’s most interesting art and architecture projects, large and small – not including the Burning Man himself, immolated on Saturday night. If you can’t imagine schlepping all the way into the desert to see them, it’s OK: some of the ones not burned to the ground may very well be coming to a public plaza near you. One of the most ambitious project at this year’s burn – and at 2.6 miles long, the physically largest project ever built here – is the cerebral but playful Straightedge by Ardent Heavy Industries. Straightedge illustrates the curvature of the earth, and dispels our visual assumption that any stretch of the planet is as flat as it looks. The collective of artists achieves this by placing poles 50 feet apart for 2.6 miles, each adorned with two LED lights controlled by satellite to blink in unison. At one end of Straightedge, the lights are right next to each other. But one line of lights follows the surface of the actual earth: the other is actually straight. At first, the two lines start to drift apart incrementally by inches. By the end of the 2.6 miles, they lines are about five feet apart, and shattering the idea that the flat looking playa is so level after all. Ardent Heavy Industries also returned to Burning Man this year with an updated version of 2πR, a delightful interactive piece where users dance on a circular stage and their movements create corresponding bursts of flames around them. It’s a slightly safer cousin of AHI’s infamous piece Dance Dance Immolation, in which participant would dance in a flame-retardant suit; when they put a foot wrong, they would be blasted by fire. (As Ardent member KC Crowell explained, Dance Dance Immolation won the Guinness Record for Hottest Video Game and the project was destroyed in a blaze of glory “by dropping a piano on it” a couple of years ago.) 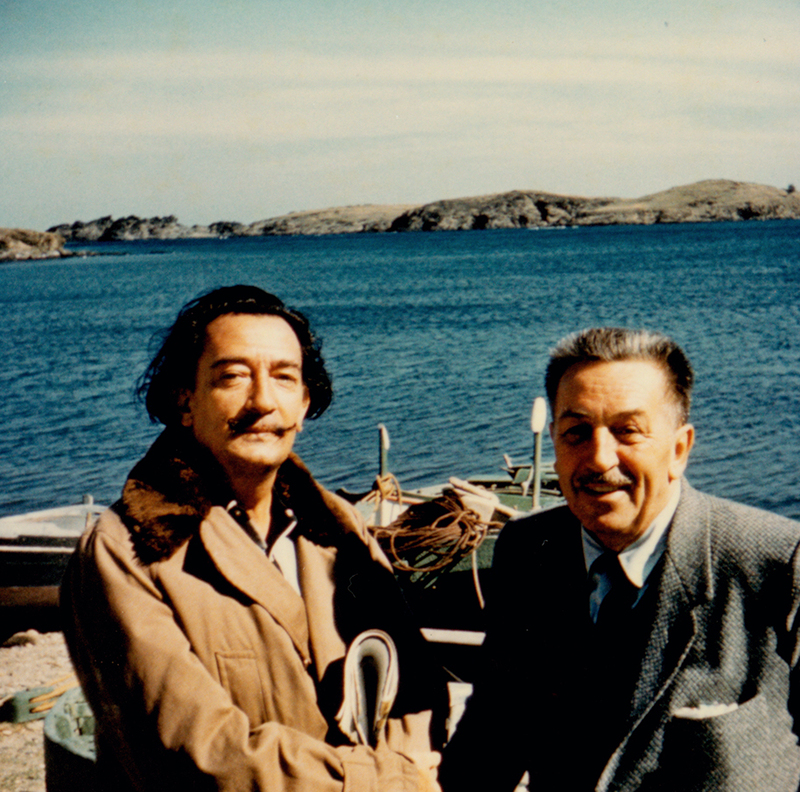 . . . .
From an intangible dream to a phantasmagorical reality, The Walt Disney Family Museum is excited to announce Disney and Dalí: Architects of the Imagination, on view from July 10, 2015 through January 3, 2016. Guest-curated by filmmaker Ted Nicolaou, this extraordinary, immersive, and enriching experience tells the story of the unlikely alliance between two of the most renowned innovators of the twentieth century: brilliantly eccentric Spanish Surrealist Salvador Dalí and American entertainment innovator Walt Disney. Presented through an interactive multimedia experience of original paintings, story sketches, conceptual artwork, objects, correspondences, archival film, photographs, and audio—many of which highlight work from Disney studio artists Mary Blair, Eyvind Earle, John Hench, Kay Nielsen, and more—this comprehensive exhibition showcases two vastly different icons who were drawn to each other through their unique personalities, their mutual admiration, and their collaboration on the animated short Destino. Although the film was not completed during their lifetimes, the friendship between these two great men nevertheless endured. Born almost three years and half a world apart, Disney and Dalí’s boyhood imaginations were grounded in their upbringing in the 1900s, causing their lives, careers, and legacies to be paralleled on a level unlike any other. Though they may seem like opposites on the surface, a deeper look into the lives and artistic prominence of the surrealist and the dreamer—highlighted through hand-written letters, alongside archival film and audio—will showcase just how alike these two innovators really were in blurring the lines between reality and dreams.